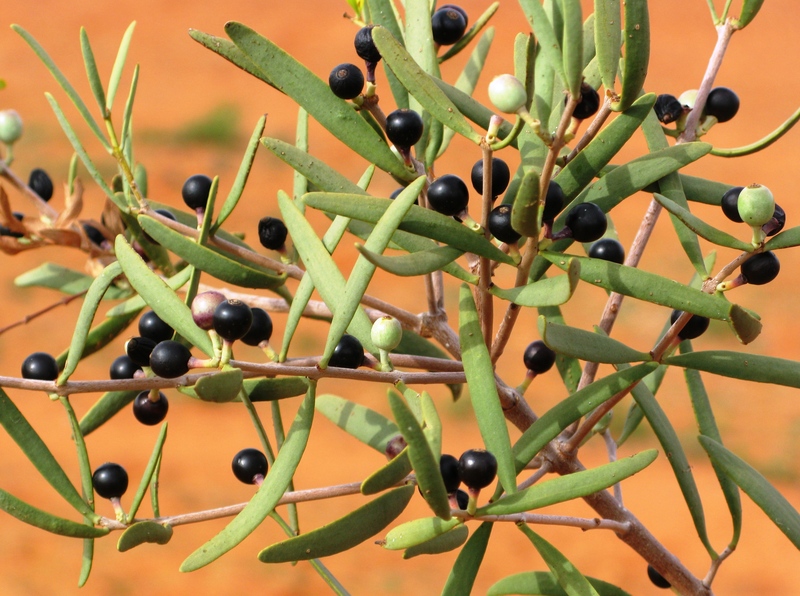 With the sole exception of the Western Australian Christmas Tree which has dry winged seeds that are wind-dispersed, every Australian mistletoe has fleshy berry-like fruits containing a single large seed. These fruits are used to induce birds to consume the fruit, thereby removing the seed and taking it away from the parent plant. While many plants rely on birds as seed dispersers, mistletoes are especially dependent on the services of birds to take their seeds and “plant” them upon the branches of a likely tree, ideally an uninfected host. In order to attract birds, the fruit are generally brightly coloured (red, white or yellow, occasionally black) and borne in clusters on stout stalks for easy removal. The skin of the fruit is typically quite tough and contains the sticky pulp surrounding the seed. As well as various sugars, the fruit pulp of many species is rich in fat and protein, including essential amino acids. The exact composition varies between species, but those mistletoes dependent on nitrogen-fixing hosts (e.g., Casuarina, Allocasuarina and Acacia species) appear to have consistently higher fractions of protein in their fruit than species growing on other hosts. Harlequin mistletoe full of fruit. Like other Lysiana species, fruit colour is polymorphic, ripening to either red or black. A wide range of birds feeds on mistletoe fruit, but a relatively small number have been recorded dispersing viable seeds. Two of these—the Painted Honeyeater and Mistletoebird—are considered mistletoe specialists as their diet is composed primarily of mistletoe fruit. While they occasionally eat other fruit and include insects in their diet when growing a new set of feathers, these birds eat little else—they even feed mistletoe fruit to their chicks. While some mistletoe specialists elsewhere regurgitate seeds after the pulp has been digested, both of these species defecate the seeds. The seeds retain some of the viscin, often coming out in strings and needing vigorous wiping and pecking to remove them from feathers around the vent. Although Mistletoebirds occasionally perch sideways on the branch to help remove seeds, this has been exaggerated and they do not necessarily perch “side-saddle” as claimed in folk-lore. As well as adult birds, nestlings also display these behaviours, often with a parent in attendance to help remove the seeds, then wiping them on a nearby branch. Naturalists have noted that this can result in many mistletoe plants growing at the site of last year’s nest. Both these species have modified digestive tracts, allowing seeds to avoid the muscular gizzard and pass through relatively unscathed. This also affords rapid gut passage rates, with the average mistletoe seed taking just 14 minutes to go through a Mistletoebird (24 minutes for the Painted Honeyeater). Several other honeyeaters are regular mistletoe consumers and dispersers: Spiny-cheeked, Singing and Striped Honeyeaters and, to a lesser extent, Olive-backed Oriole, Yellow-throated Miner, Fuscous and Grey Honeyeaters, Red Wattlebird and Silvereye. These ten species have broad diets (including a wide range of fruit, extending to nectar and insects) and are considered to be dietary generalists compared to the two mistletoe-fruit specialists. Finally, there are some birds that eat mistletoe fruit opportunistically which may disperse viable seeds occasionally, including Rose-crowned Fruit dove, Brown Cuckoo dove, Black-faced Cuckoo Shrike, Metallic Starling and at least 12 other honeyeater species. In addition to being consumed, the sticky seeds of mistletoe may adhere to the feathers (or fur) of other animals visiting the clumps, subsequently being preened or groomed off and wiped on a branch or twig. 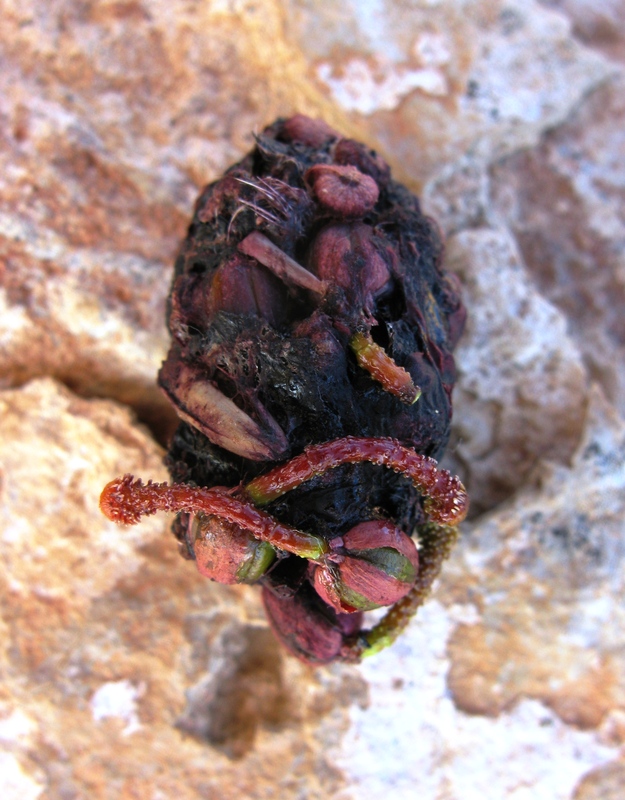 This form of external dispersal has been well studied in the dwarf mistletoes of North America and can lead to successful dispersal over far greater distances than internal dispersal. This dispersal mode is considered to be a rare or accidental form of dispersal in Australia, but may be one of the mechanisms leading to widely disjunct populations of mistletoe separated by the ocean or other unsuitable habitats. Specialists versus generalists. While Australia’s two mistletoe specialists are generally assumed to represent the main dispersal agents and account for the vast majority of mistletoe plants established, some recent research has called this into question. By definition, the staple diet of mistletoe specialists is mistletoe fruit, and they are known to undertake large and small scale movements to track fruit availability. 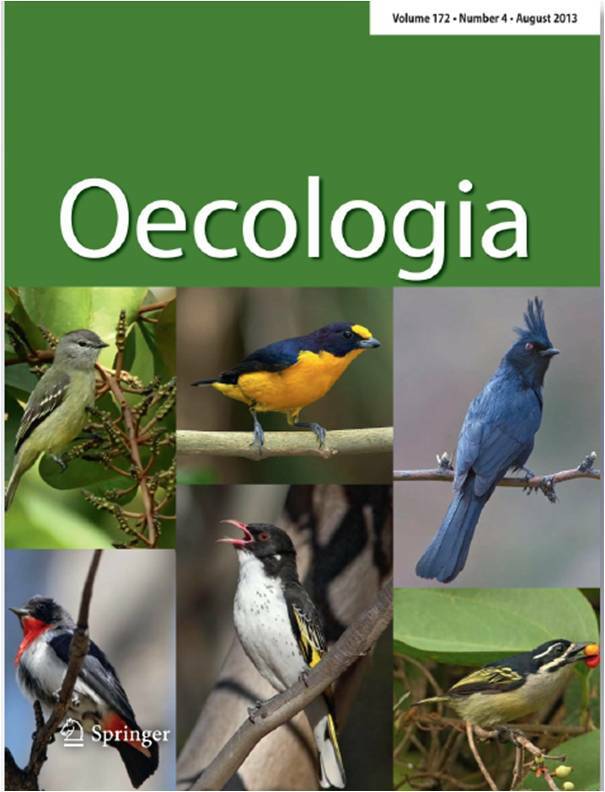 Painted Honeyeaters nest preferentially in areas of higher mistletoe density and even time their breeding so that the chick fledging period coincides with the maximum availability of mistletoe fruit pdf. But, if the specialists spend all of their time in areas with mistletoe, how does mistletoe spread to unoccupied areas? Using banded birds, bird call recorders and systematic searches for dispersed mistletoe seeds, some research in semi-arid Acacia woodlands in the northern Strezlecki Desert demonstrated this pattern with Mistletoebirds: the birds only visited stands that were already infected with mistletoe, while uninfected stands were not visited and received no seeds pdf. If the only birds moving mistletoe seeds around are specialists, this could easily result in infected trees becoming increasingly infected. Over time, this would lower the survivorship of hosts and potentially compromise the longer term viability of the entire mistletoe population via increased sensitivity to drought or other unpredictable events. The non-specialist birds that regularly consume mistletoe fruit may be involved. The broader diet of these species means that they depend on other food sources and visit mistletoe-free areas, potentially leading to increased dispersal to uninfected trees or entire stands free of mistletoe plants. Another recent study adds credence to this idea pdf, using radio-tracked Spiny-cheeked Honeyeaters. In addition to spending time in and around heavily infected shrubs, these honeyeaters routinely travelled long distances to areas without any mistletoe. Importantly, the travel time was less than the time it takes for a seed to pass through their digestive tract (around 40 minutes), and their preferred perches were on thin branches on the edge of tree crowns. This suggests that these non-specialists may be more important in establishing new populations of mistletoe, whereas the specialists likely maintain existing populations. So, incorporating all of these ideas, past Honours student John Rawsthorne and I proposed the idea that mistletoe specialists are not the co-evolved mutualists that ecology textbooks would have us believe. Rather, they are better considered exploitative, taking advantage of a reliable and highly nutritious food, their repeat visits to fruiting mistletoe intensifying existing infections and making fruit resources more concentrated and defendable pdf. We suggest the main agents of mistletoe dispersal in many areas are generalist foragers, thier broader diet and longer gut passage rate making seed dispersal tom unifected trees and stands more likely. 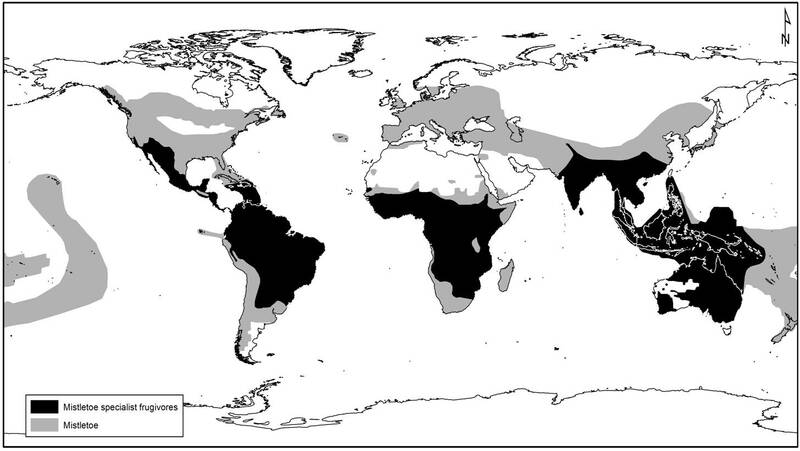 While mistletoe specialists need mistletoe, the reverse does not hold—mistletoe in many regions is dispersed solely by dietary generalists.